Below is the rest of the calendar I made for Christmas presents. I used a theme each month that represents that month. 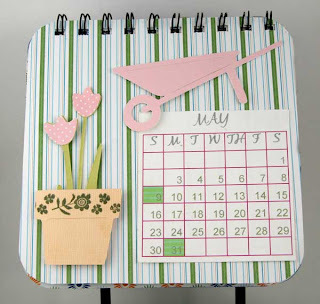 My Cricut cut all the parts of the calander. Many dimensionals were used to pop things up and I absolutely loved my new Creatopia to glue all the small things and words. What a time saver it is. I just loved this cross! stamp from Crafty Secrets. I paper pieced the flowers. our soldiers have done for us! for the bird's eye and the hole in the birdhouse. Stewart's large spider punch was perfect too. pattern paper and this is how it turned out. I loved it! 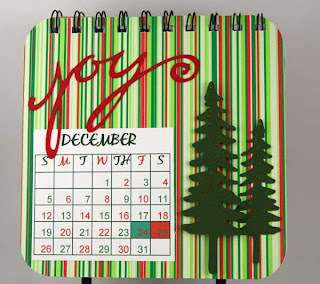 December is a month of joy and celebration for Christ's birth. The trees are popped up with dimensionals by Therm-o-Web. 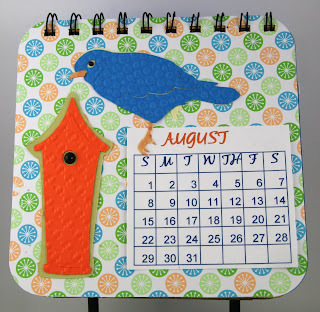 I hope you have enjoyed seeing the calendar I made. Printing the calender on the computer allows me to print a 2911 calender and send to everyone who received our gift this year. I am sorry for he large print for the first post I made with the calendar. I changed it about a half dozen times and it was correct before I hit publish post, but enlarged the print when I posted it. Nothing I did corrected it. Blogger does that at times and I certainly wish I knew how to fix it, but I don't. I hope it does not do the same time with this post. 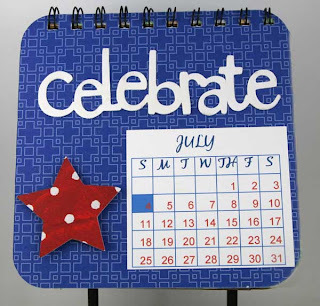 Thank you for sharing the pics of your awesome calendars. How much fun it was to see the rest of the calendar pages! AWESOME job my friend! WOW ... no wonder it took you longer than expected ... that's a lot of work for ONE and you did 20!!! Yikes! You should be very proud of yourself ... there was certainly a LOT OF LOVE that went into this gift! GREAT job!! These are fantastic! Wow I can't believe you made 20 of these! Thanks so much for sharing them with us! 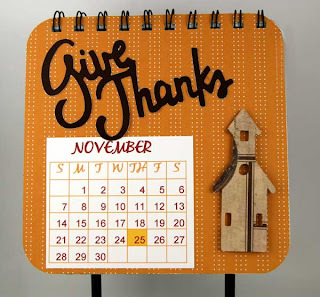 Let us know when you get the calendar stands in! Tks! 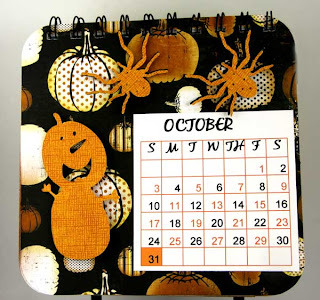 Joan, these calendara are adorable! I do believe I will have to case your idea for next year and I never thought of using my cricut for this. I love the papers and the accents you used. 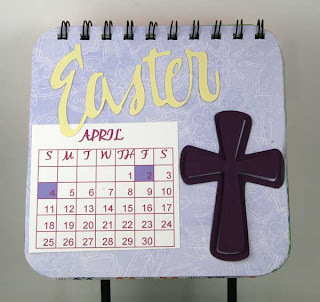 Did you make the calendar books yourself or were they a pre-assembled book? Would love to know so Ican purchase them. I do not have a bind it all if you made them. 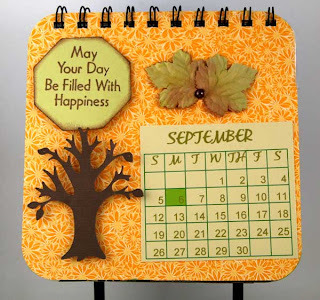 Your calendar came out wonderful. It looks as though you spent a good deal of time and thought into making it. I'm sure that your friends and family loved getting them. Every month is adorable. I love the Zutter stand and will want to order some of those the minute you have them in your store. Everyone I know will want to make a calendar so I had better get busy. So glad you shared the rest of the calendar pages Joan. They truly are adorable! I love each and every month! 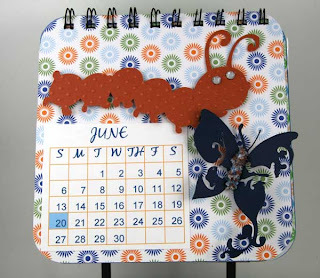 Joanie: What a neat calendar....It inspires me to try my hand at one......I am a flower nut so will be using a floral theme. Happy New Year!